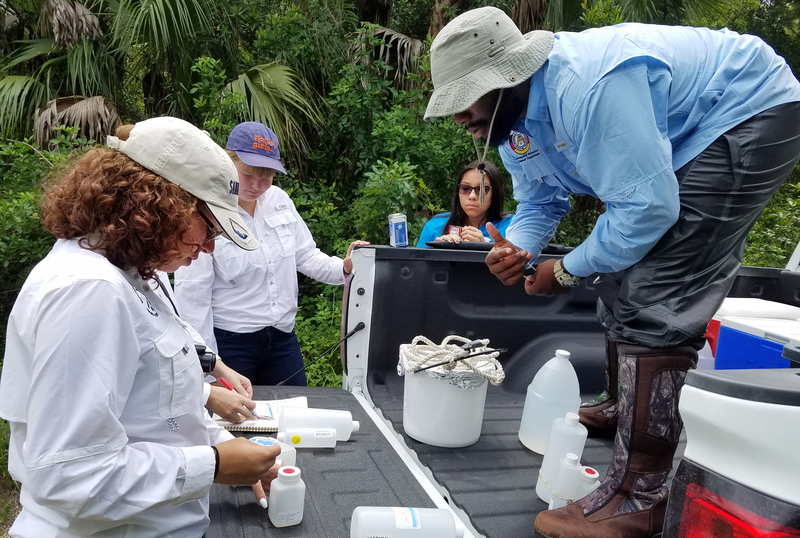 The Environmental Resource Management Department spent the summer teaching a group of 31 interns about the environment and conservation management through 10 weeks of hands-on experience. The Restore Student Internship program is funded by a grant from the Restore Council, created in 2012 after the 2010 explosion the BP Deepwater Horizon oil rig in the Gulf of Mexico. The Tribe obtained access to the grant with the help of the BIA. Although the grant ends this summer, Maples said the experience of running the program for two years gives ERMD the ability to create one of its own, should the department choose. The program is for youth ages 14 to 24. Most interns this summer came from outside of the Tribe, but 12 Seminole descendants participated. 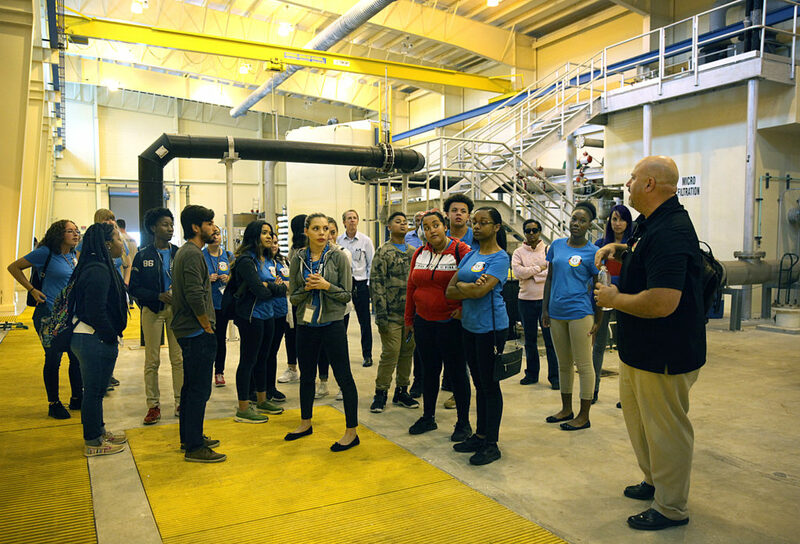 During the program, the interns went on educational field trips to places such as the Nova Southeastern University’s Oceanographic Center in Dania Beach. They also rotated between the seven ERMD divisions, which include administration, operations and maintenance, forestry, water quality, watershed management, environmental science and environmental compliance, where they learned about careers in conservation. ERMD manages the land and water tribal-wide and follows the same guidelines as the National Resources Conservation Service. 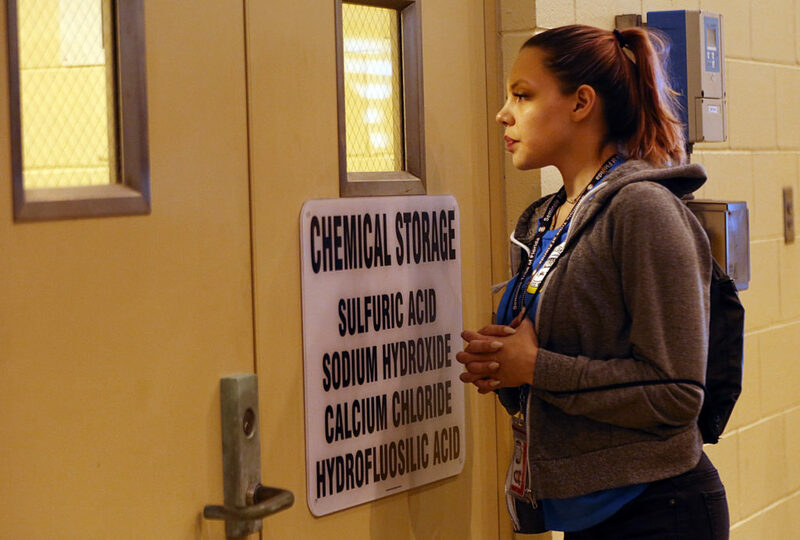 The Tribe has its own federally recognized water standards and samples its water twice monthly. On July 11, the interns attended the Seminole Water Commission meeting to see the government process in action and toured the Brighton water treatment plant. The interns were shown how the plant turns raw water into clean, clear water through reverse osmosis. Raw water has a lot of organic material, salt and iron, which are stripped away during the process. Nutrients are then added to make the water palatable and safe to drink. “I wanted a better understanding of the environment and how the ERMD department works,” said intern Elizabeth Martinez, 18, of Miami. Tomas Perez, originally from Argentina and now from Miami, studied environmental engineering at Florida International University and joined the Restore program to learn about the process and hopefully get a job with the Tribe. 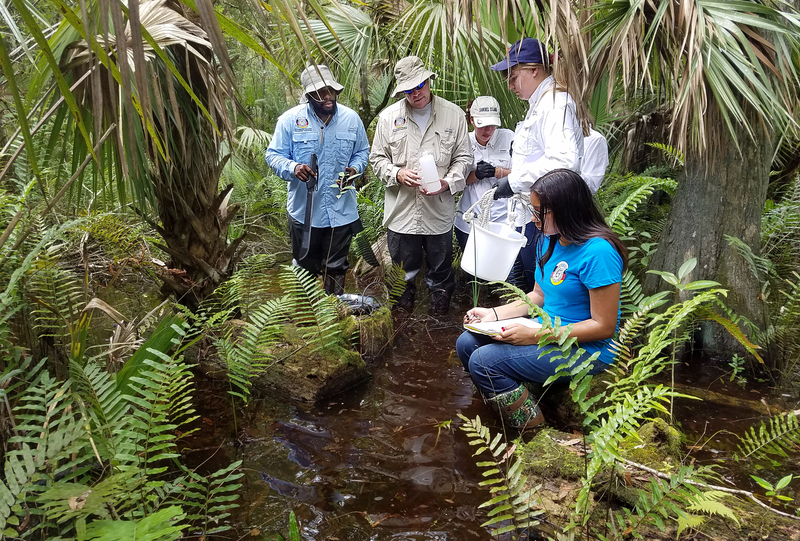 A group of interns ventured on foot into Big Cypress’s flooded native area July 12 to take water samples and coordinates. The group included Andra Danu, Arriana Torres and Gracie Lorber, who all attend Pompano Beach High School, and Mikiyela Cypress, who attends the Ahfachkee School. The group began by trudging into the swamp, where the water was thigh deep in places, until they found the exact GPS coordinates. There they filled bottles with water which would be tested for dissolved oxygen, pH, temperature, conductivity, total phosphorus, total Kjeldahl nitrogen, potassium, alkalinity, chloride, color, silica, sulfate, calcium, magnesium and sodium. The water in the native area and the canals are sampled twice month to characterize the existing water quality. Water in the native area is not impacted by the canals. Mikiyela joined the program because she had a similar experience during an Ahfachkee science program.